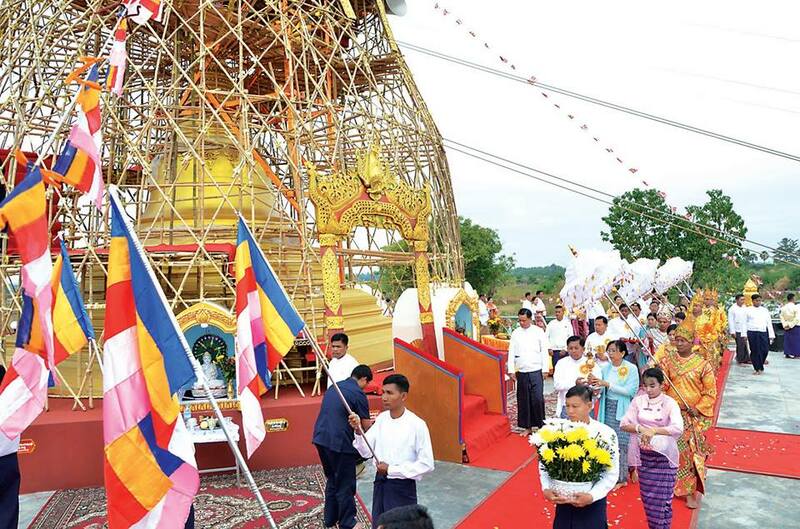 A ceremony to hoist a golden umbrella atop Myaynitaung Pagoda was held in conjunction with the consecration ceremony near Nay Pyi Taw Airport in Lewe Station this morning, attended by members of the Sangha led by Presiding Nayaka of Myothit Dhamma Rekkhita Monastery of Ela Bhaddanta Vimala, Commander-in-Chief of Defence Services Senior General Min Aung Hlaing and wife Daw Kyu Kyu Hla, Deputy Commander-in-Chief of Defence Services Commander-in-Chief (Army) Vice-Senior General Soe Win, Commander-in-Chief (Navy) Admiral Tin Aung San and wife, Commander-in-Chief (Air) General Khin Aung Myint and wife, senior military officers from the Office of the Commander-in-Chief and their wives, the commander of Nay Pyi Taw Command, offi cers, other ranks and families. 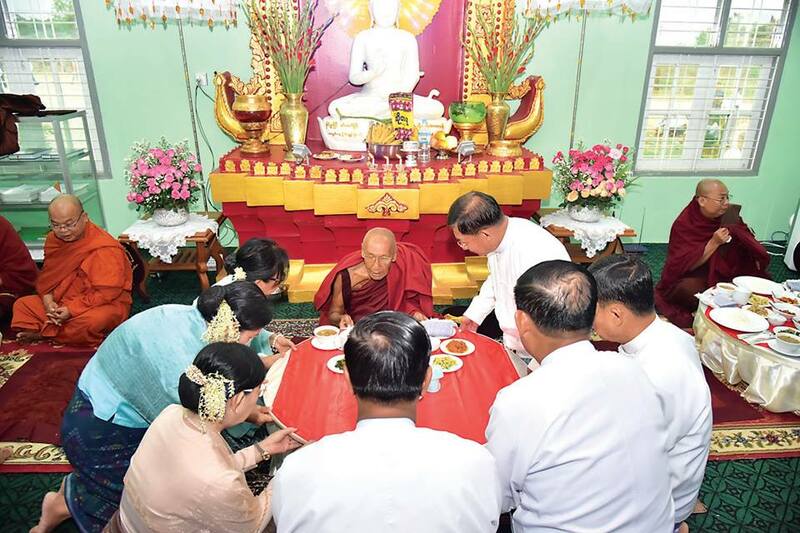 First, the Senior General and congregation took the Eight Precepts from Presiding Nayaka of Myothit Dhamma Rekkhita Monastery of Ela Bhaddanta Vimala and Metta Sutta. Flowers, water, thread and sand dubbed through Paritta were scattered in the precinct of the pagoda. 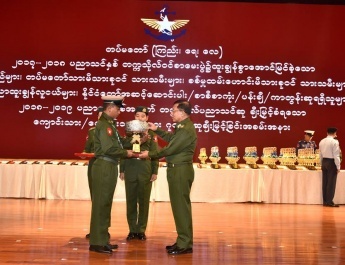 Then, the Senior General and wife, the Vice-Senior General, the Commander-in-Chief (Navy) and wife, the Commander-in-Chief (Air) and wife, and senior military offi cers and their wives donated jewellery-decorated diamond orb, pennant-shaped vane, tiers of golden umbrella and offertories to members of the Sangha. After taking a sermon delivered by Abbot of Gainghtauk Monastery of Ela Bhaddanta Ñanissara, they all shared merits gained. 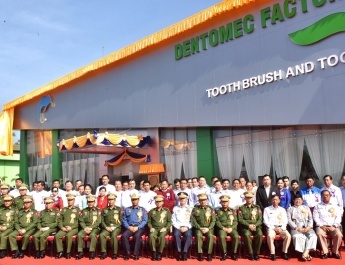 The Senior General and party went round the pagoda by conveying jewellerydecorated diamond orb, pennant-shaped vane and tiers of golden umbrella three times. The Senior General and party sent tiers of golden umbrella atop the pagoda by decorated fl oat and sprinkled scented water on them. Then, they performed the rituals of golden and silver showers in commemoration of the successfully completion of hoisting the golden umbrella. The Senior General and wife offered fl owers, water and oil lights to the Buddhaimage at the pagoda and sprinkled scented water on the stone post of the pagoda. Members of the Sangha consecrated the pagoda. 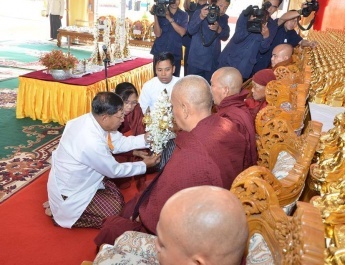 After the ceremony, the Senior General and party offered alms to members of the Sangha. Myaynitaung Pagoda was built by wellwishers near the airport in Lewe Township, Dekkhina District of Nay Pyi Taw Council Area around 1243 Myanmar Era (1871 AD). As the pagoda was located far distance from the village, it lost the decorated colours due to lack of maintenance. So, it became a short structure. 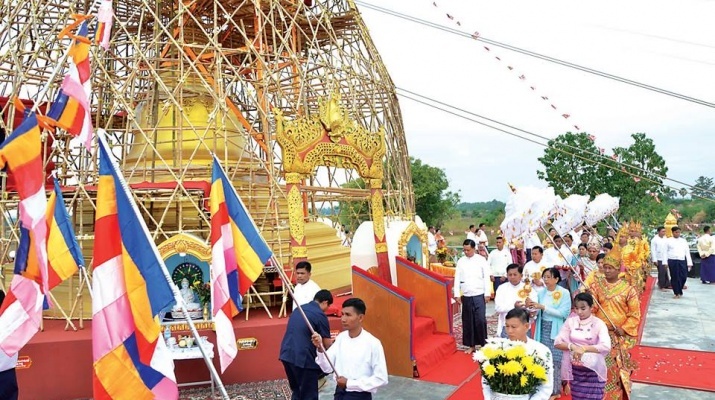 At present, families of Tatmadaw (Army, Navy and Air) and well-wishers from nearby villages collectively renovated the pagoda and hoisted the umbrella atop it.